BRUSSELS (AP) — The latest news as migrants fleeing war or seeking a better life make their way across Europe by the tens of thousands. All times local. Bulgarian President Boyko Borisov abruptly abandoned an EU summit focusing on migrants after reports of violence on the Bulgarian-Turkish border between border guards and refugees. EU Council President Donald Tusk said early Friday that Borisov informed him before leaving the summit, where leaders agreed to beef up external borders and argued over what to do about half a million refugees and others who have arrived in Europe this year. European leaders have agreed to boost the bloc’s border agency amid a huge refugee crisis, giving it responsibility to deport people who do not qualify for asylum. The agency, Frontex, will become a more “operational body,” EU Council President Donald Tusk told reporters early Friday after an EU summit. However, the leaders meeting in Brussels struggled to come up with firm new money to help Turkey and other countries cope with the flow of people. European Commission President Jean-Claude Juncker said the union is 2.3 billion euros short of promises, but that leaders pledged at the summit to speed up efforts in the coming weeks. The U.N. chief says all migrants, not just political refugees, deserve protection, help and support. 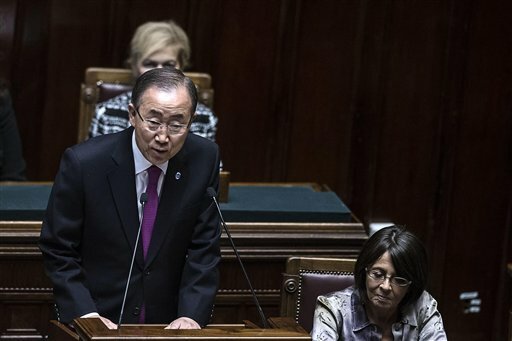 Ban also said all countries are obliged to shoulder the burden of welcoming migrants, not just those on the front lines like Italy and Greece. His words have special resonance in Italy, which has demanded Europe do more to take in refugees. At the same time, Italy has insisted that the EU repatriate economic migrants who don’t qualify for political asylum. Greece’s coast guard recovered seven bodies — including those of three children and a baby — and was searching for another person missing Thursday after a wooden boat carrying migrants collided with a patrol boat and sank during a rescue operation near the eastern Aegean island of Lesbos. The coast guard said 31 people were rescued, and survivors reported eight more were missing. Seven of the missing were later found dead — two women, a man, three children and a baby. The incident occurred half a nautical mile north of Lesbos, the island that has been the entry point of the majority of those making the journey from the nearby Turkish coast. EU President Donald Tusk leaders of member states will discuss more aid for Turkey, Jordan and other countries with large number of refugees to reduce the odds the exiles will try to resettle in Europe. Tusk is hosting an EU summit in Brussels where leaders are scheduled to discuss the situation in Syria, Turkey and other countries. Turkey is now home to about 2 million Syrians who have fled fighting in their homeland. French President Francois Hollande says the 28-nation EU must help major refugee-hosting countries like Turkey, Jordan and Lebanon or risk the humanitarian “drama” of more waves of migrants attempting to reach Europe. The coast guard said 31 people were rescued, and the survivors reported eight more were missing — of whom four were later found dead. Lesbos has been the entry point to the EU for most of those making the journey from the nearby Turkish coast. On Wednesday, divers recovered the bodies of a woman, a young girl and an infant from an overturned inflatable dinghy after an all-day search near Lesbos. The Hungarian government says a fence built on the border with Croatia has been completed and a decision on closing that border section to the free flow of migrants could be made soon. Janos Lazar, Prime Minister Viktor Orban’s chief of staff, said Thursday that a decision depended on Orban’s meetings later in the day in Brussels about the migration crisis. Earlier, Lazar had said that Hungary was consulting with Austria and Germany about the issue. Nearly 380,000 migrants have entered Hungary this year. The fence protected with razor wire built on the border with Croatia comes after a similar barrier was set up on the border with neighboring Serbia. Hungary has also made cutting through or crossing the fence a crime. Nearly all the migrants entering Hungary quickly make their way to Austria and then to Germany and other EU members. Croatian Foreign Minister Vesna Pusic urged European leaders to support Turkey in dealing with refugees and migrants, design a common EU asylum policy and strengthen Frontex, the European border agency. She spoke during a visit Thursday to the Opatovac Admission Center, where asylum seekers are given clothing, food and some shelter from the cold before they board buses or trains to move on to Hungary. If countries insist on border control, she says, “they can support Frontex instead of building walls and iron curtains in Europe again 26 years after we brought them down,” Pusic said. German lawmakers have passed a bill aimed at streamlining the country’s asylum system by cutting red tape, speeding up deportations of rejected applicants and curbing cash benefits. Human rights groups say the legislation could leave migrants homeless and destitute. Lower house lawmakers approved the bill Thursday following a debate in which German Chancellor Angela Merkel spoke of the “historic challenge” posed by the massive influx of migrants. Almost 600,000 people have sought refuge in Germany alone this year. Under the legislation, which still needs upper house approval, Albania, Kosovo and Montenegro will be deemed safe states, meaning their citizens can be sent back faster. Integration courses for people likely to get permission to remain in Germany will also start sooner. Finland’s Border Guard police, working with Swedish officers, have arrested 15 people suspected of running an “extensive” human trafficking ring which has smuggled dozens of migrants from Sweden to Finland. Border guard officials said Thursday that the suspects are Iraqi-born residents of Finland and Sweden. They are suspected of bringing at least 100 persons to Finland from Turkey via Sweden over the past year. The suspects have received “substantial financial gain” from running the ring charging sums of up to 10,000 euros ($11,500) for a single trip from Turkey to Finland, officials said. Migrants have mainly been brought to the northern Finnish town of Tornio from the Swedish border town of Haparanda. Officials say ferries running between Finland and Sweden and scheduled flights have been used, officials said. Some 12,000 Iraqis, or 70 percent of all applicants, have asked for asylum in Finland this year. Some 11,000 asylum seekers arrived in Finland in September. The operations chief for Europe’s top law enforcement agency says established organized crime networks are making new connections as they jump into the business of smuggling migrants hoping for a better life. Wil van Gemert, Europol’s deputy director for operations, told The Associated Press that the networks were taking advantage of desperation to make a profit. He spoke on the sidelines of a joint conference Thursday with Interpol that gathered law enforcement representatives from 50 countries to discuss how to join forces against the smuggling networks. Syndicates from different parts of Europe, with backgrounds in drugs and money laundering or other illicit trade, are in communication to offer a form of coordination in moving people northward. A top European Union official is pressing leaders of the 28 member states to live up to pledges to tackle the refugee emergency and says their credibility is at stake if they fail to act during Thursday’s summit meeting. Juncker’s statement came as EU leaders converged on Brussels for a summit focused on the refugee crisis. The leaders promised last month to massively step up spending and provide more experts to help fingerprint and screen the thousands of people arriving in Europe daily seeking refuge or jobs. But few countries have come forward with money or personnel. Greece’s coast guard says it has rescued 830 people in 20 search and rescue operations between Wednesday morning and Thursday morning off eastern Aegean islands. The rescues, which occurred near the islands of Lesbos, Chios, Samos, Agathonissi and Kos, do not account for those who reach the shores themselves, generally in overcrowded inflatable dinghies. On Wednesday, authorities recovered the bodies of a woman, a young girl and an infant from an overturned dinghy spotted by a helicopter of the European Union border policing agency Frontex. The recovery came after an all-day search following the rescue in nearby Turkish waters of 21 others who had been in the dinghy. Hundreds of thousands of people fleeing war and poverty in their homelands have crossed illegally from Turkey to Greece this year. German Chancellor Angela Merkel says Europe must cooperate with Turkey in order to tackle the migrant crisis. Merkel says that by improving conditions in those regions where migrants come from they may be dissuaded from traveling to Europe. She told German lawmakers Thursday that “without doubt Turkey plays a key role in this matter” because it hosts almost 2 million Syrians and is a key transit point for migrants coming to Europe. Merkel, who travels to Istanbul on Sunday, says talks with Turkish leaders won’t tie cooperation on the refugee issue to the country’s future membership of the European Union. Tags: border, Brussels, Crisis, Europe, Frontex, Refugee. Bookmark the permalink.